Die Seemeu cinematographer, Chris Vermaak. 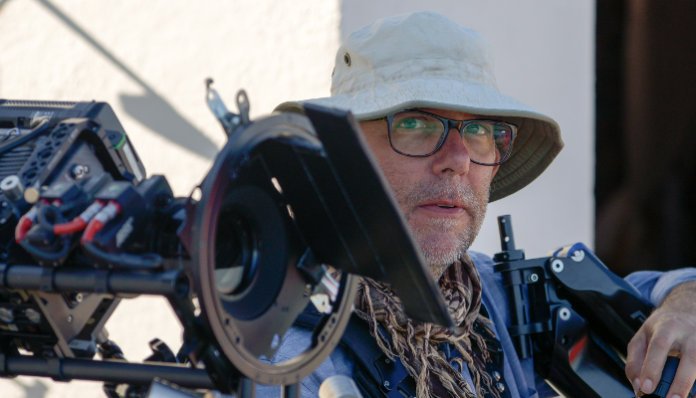 Chris Vermaak is an expert Steadicam operator and has served as DoP on three Christiaan Olwagen films in the past few years. Screen Africa chatted to him about he brought his unique visual style to the Die Seemeeu – a mostly-Afrikaans adaptation of Anton Chekhov’s play, set for nationwide release on the 5th of April. What is your background as a DoP, and how did you first get involved with Christiaan Olwagen as a director? I cut my teeth as a DoP doing SABC drama in Johannesburg. It was a great way to learn how to make do with minute budgets and little time. It was in this world that I first introduced my then-rudimentary Steadicam skills to try and add as much production value as possible in the least amount of time. I progressed into commercials work and honed my skills, continually operating Steadicam on various feature films and TVCs. I received a call from Christiaan asking me whether I would like to DoP Johnny is nie dood nie literally days before they would start shooting. Christiaan had this idea that he wanted to keep the performances and the flow of time real: reel time becoming real time. I leapt at the opportunity. It was certainly not the first time in history that long takes without cuts would be used but….wow! This was for every scene! A whole movie of one takes! You’ve worked on three of Christiaan’s films in the past few years: Johnny is nie dood nie, Kanarie and now Die Seemeeu. From your perspective, to what extent do you think these films should be viewed as a “trilogy”, if at all? These three movies are unique in their visual style. All three movies were shot with basically the same collaborators and in a very short space of time (as movies go).This allowed not only the people involved to really get to know each other, but also that we could keep sight of an overall ethos – a manifesto as to our sensibility across all three projects. All three are a testament to us shaping this strange style of theatrical cinema. Johnny and Kanarie were set in very Afrikaans backgrounds and had us re-thinking our own ideas about ourselves and our past. What did the war do to us? What did Apartheid do to us? What did our super-controlling, morally reprehensible yet deeply religious government do to us? Die Seemeeu is the existential question we need to ask ourselves after dealing with all of that. It has the most universal theme of all three movies. Your website states that “A whole story can be told in a single frame”… What is it about the one-take style enabled by Steadicam shots that so appeals to you, and when did you realise that you wanted to specialise in this style? There is a certain honesty that is inherent in a oner. It’s like when a magician shows you a trick “right before your eyes.” The audience don’t think that they were fooled – but, of course, they were. The material we are shooting is scripted. The people you see are actors. Of course we want to manipulate you into having emotions! That is what YOU want, too. It takes believable performances and perceived visual honesty to have people suspend their disbelief. Even though they obviously are still aware that they are watching a movie. We can’t cut to a close up if someone starts crying. If you deserve a close up the camera needs to get that close to you. We can’t use one actor’s good take with a different take that worked with the other’s good performance. The passage of time is real. The timing of one actor’s performance with another is real. All these things make the audience trust in the fact that you are telling it like it is. That this is “a real story” – whatever that means. Of all the ways to move a camera through space and time, the Steadicam is the platform that most closely mimics human movement. It behaves like a head on a neck. It follows humans where they go. It listens to them talking. When it does point of view shots, it pretends to be human. At other times, it just floats through people’s lives like a voyeuristic ghost. What, in your opinion, does this camera style add to this film adaptation of The Seagull? Do you think it works particularly well with the ‘theatrical’ mode of performance, for example…? Yes. We only shot Die Seemeeu after Johnny and Kanarie, and – in a way – it was as if we had developed this style for this movie. Ironically, we did experiment with shooting coverage during the filming. It just felt wrong. I remember reading a critique in The Guardian of the Michael Mayer adaptation of The Seagull with Annette Bening as Irina. It was released way before Die Seemeeu and obviously made with much more budget. The reviewer said that – and I am paraphrasing here – even though the material was fantastic and performances were great, there was something that kept bugging him: the fact that it was cinema. I was intrigued with this, as we had obviously done something different. Something much more theatrical, but also cinematic. Hopefully to successful ends. Anton Chekhov once said, “Don’t tell me the moon is shining; show me the glint of light on broken glass.” What sequences/shots were you particularly proud of this time around, and please share any information about how they were achieved. The whole performance of Konstant’s play on the lake was just beautifully absurd and so visually pleasing. The location was spectacular but the weather gave us hell the whole first week of shooting! We lost so much time. When we came back and finished it in that unbelievable dusky light we couldn’t believe it ourselves! When you have to finish a scene before the sun goes down and try to maintain lighting continuity it is a blessing to be shooting one take! What equipment was used on the shoot? Any final reflections on the experience of shooting these three films? I really feel privileged to have done these three movies with Christiaan. We couldn’t solve problems with money but were always brave in our choices. Strapping slide projectors to cameras, spinning the whole screen 360 degrees, not cutting even though it would have solved myriad practical problems. Always finding a way to stay true to our manifesto and giving the actors the stage. If all life be a stage, play on. Die Seemeu is out now. Next articleWhat makes a Sundance-winning short film?